Doctoral research at the University of Brussels (VUB) showed that an increase in Productivity of a club can be explained for 54% by the double pass Talent Development Framework (Pauwels, 2016). The other 46% are non-controllable factors on which a club does not have any impact on. The development of the Framework is based on two different strategic management philosophies as a reason for success; a market- and resource-based view and a holistic approach. Firstly, strategic management philosophies such as the resource-based view (1) or the market-based view (2) regarding organisational effectiveness are complementary appliedin the Framework. Quality standards regarding resources and processes which influence the Productivity are defined. Furthermore, different club revenue levels & competition market are taken into account when analysing a Youth Academy. The club’s access to optimal resources (staff, facilities, etc.) and efficient processes (team development, individual development, HRM, etc.) to use these resources results in a sufficient organisational strategy and competitive advantage (green colour). Resources can be specified as physical, human or organisational assets of a football club. Whereas the organisation of resources in combination with implicit elements (e.g. specific knowledge, experience, etc.) are defined as processes. 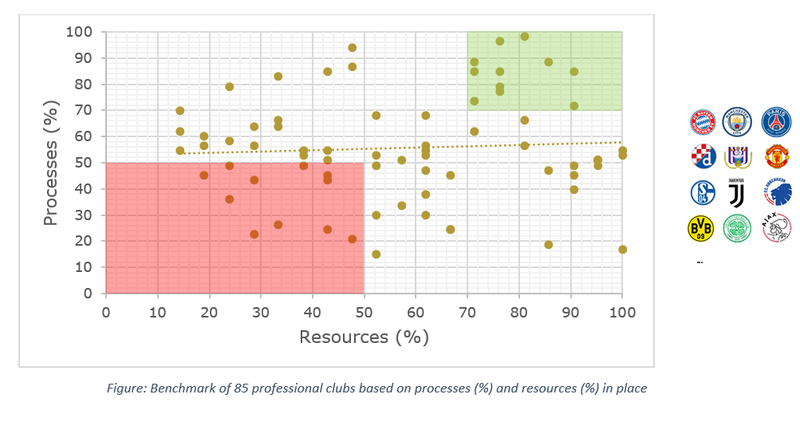 The resource-based philosophy focusses on the unique characteristics of resources that a football club has in the development of a sustainable competitive advantage. The role of the Senior Management of a club in converting all these valuable resources and processes into an optimal configuration for competitive advantage cannot be underestimated. A second philosophy refers to the double pass Framework using a holistic approach. 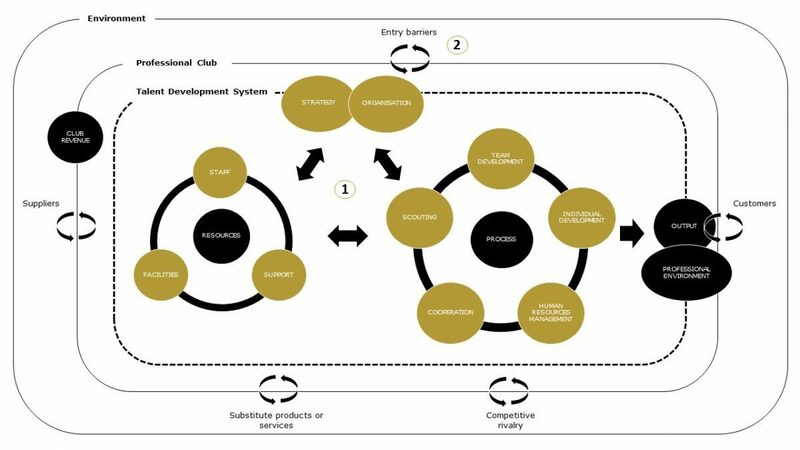 A professional football club is situated in an open social system and permeable for influences of internal and external stakeholders (systems theory approach). This theory states that a change somewhere in the system will likely create changes elsewhere in the system. As a consequence, it is not possible to describe a talent development system without reference to the environment of the club. Discussing just a part of a system is a reductionist strategy. The whole has features that will not appear identically from an analysis of several parts in isolation. The systems theory approach refers to the process of transforming resources into outputs.